I haven’t had a chance to use this product yet since fishing season really hasn’t started in my neck of the woods, but I sure am looking forward to it. I’ve gone out with friends that have fish finders which are mounted to the side of the boat. They obviously help when it comes to finding the fish, but really seem to be too big and the wires are always in the way. 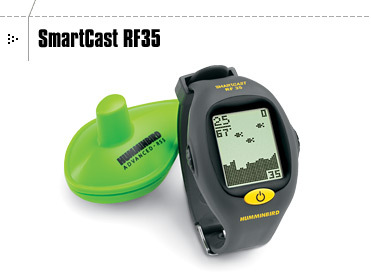 This fish finder sits neatly on your wrist and is completely wireless. The Remote Sonar Sensor is tied to a fishing line and lowered into the water. The sensors operating range is 150ft with a depth of 120ft. The wireless operating range of the watch is 75ft. The watch itself only requires a regular lithium watch battery and the sensor lasts for 500 hours of in water use. Once the sensor is taken out of the water it automatically shuts off. Like I say I haven’t used this yet, but I don’t see any downside to this product. I’ll let you know how it is once the fishing season starts.